4. Now we need the eggs, sugar, coffee and salt. Are you one of those people who, like me, had thought that cheesecake and chocolate are not possible together? Well, then I have something to tell you. Dear friends, cheesecake and chocolate ARE possible to exist together. These are our lovely ingredients. 2. …and beat them at medium-low speed until combined. Then increase the speed to medium, and beat until well blended and crumbly. 3. Pat the mixture into a lightly greased 13 x 9-inch (33 x 22 cm) pan. A good trick is to use the bottom part of a measuring cup or a glass to do that. 4. Preheat your oven to 350 °F (175 °C) and bake for 13-15 minutes or until lightly browned. This is a lovely, delicious and easy substitute for crushed wafers that are often used in cheesecake recipes. 5. Now, let’s make the cheesecake filling. Place the cream cheese and sugar in the bowl of your electric mixer and beat at medium speed until creamy. 6. Add the eggs, one at a time, beating at low speed just until blended after each addition. 7. Finally, add the sour cream, vanilla, and one cup of the chocolate chunks. Of course, you can use chocolate chips instead of the chunks. 8. Pour the cheesecake mixture over the baked crust. 9. And using a spoon or an offset spatula, even out the surface. 10. Bake at 350 °F (175 °C) for about 25 minutes or until set. 11. Remove from the oven and let cool completely on a wire rack. 12. Then melt the rest of your chocolate chunks. Microwave oven will work just fine. 13. Stir the melted chocolate until smooth. Then drizzle the chocolate over the cheesecake. 14. Cover and chill for at least 4 hours. Then cut into bars. Also, I’ve found out that it’s fine to reheat the bars in the microwave oven for a little while before serving. That way the chocolate will melt slightly making the whole eating experience even more divine. 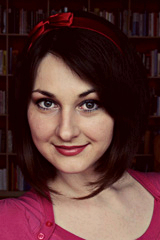 My name is Petra and I am… ahem… a cheesecake maniac. Yes, I dream about cheesecakes. Yes, I collect cheesecake recipes. Yes, I am sure I have yet many of them to prepare. No, I don’t think there is a power in this world that would stop me from doing so. Yes, I’ll be showing you all of them. Here we have our lovely ingredients, ladies and gentlemen. Of course, there’s a lot of cream cheese in there. But definitely not too much. That fact suggests that this cheesecake is a milder one. Which I definitely can confirm (after eating many, many a slices). Though it is not as rich as New York Cheesecake, I’d define it as being ‘heavenly’ mild. 1. To make it, preheat the oven to 284 F (140 C). 2. Second, using a vegetable oil, spray a 9-inch (23 cm) springform pan. 3. Wrap two layers of foil around the pan. This cake is going to be baked in a water bath and the foil will prevent the water from seeping in. 4. Place the cream cheese, butter and milk into a metal (or heatproof) bowl. 5. Now place the bowl over a pot of simmering water and – stirring constantly – let the ingredients melt. If you’ve ever wondered why bowls are sometimes placed over simmering water then I have the answer for you. It’s because the ingredients in the bowl need very mild and gentle heat to melt, nothing too strong. In cases such as these, the steam from the simmering water works best. Otherwise some ingredients might not only melt but also cook and curdle. And who wants that? 6. After the melted cream cheese mixture has cooled to room temperature, add the egg yolks, the cake flour, the cornstarch (corn flour) and the lemon juice. 7. Whisk the mixture until smooth. 8. In a separate bowl, whip the egg whites until foamy. 9. Then add the sugar and whip for another couple of minutes until soft peaks form. 10. In two batches, pour the cream cheese mixture into the egg whites. 12. …until they are well combined. Try to be as gentle as possible in this process, since we’ve worked hard to make the whites light and airy and we definitely don’t want to lose that. I am speaking in the name of all whipped egg whites in the world here! 13. Divide the batter evenly into two bowls and add the cocoa powder into one of them. 14. Mix in the cocoa gently. 15. So this is how the zebra strips are achieved – nothing difficult at all. Take your sprayed springform pan and place 3 tablespoons of cream colored batter in a circle in the center of the pan. Then take 3 tablespoons of the chocolate batter and place in the center. Keep adding circles and the batter will spread of its own accord. 16. Find a large baking dish that will fit the springform pan. Fill the empty baking dish 1/4 of the way full with hot water and place the springform pan inside. 17. Bake in the lower third of the oven at 284 F (140 C) for about 55 minutes or until a toothpick inserted in the center of the cake comes out clean. 18. Turn off the oven and leave the cake inside (with the door still closed) for another 10 minutes. 19. Remove the cake from the oven and let cool completely. This cake tastes best after it’s been refrigerated for a couple of hours. It becomes slightly more dense and moist. If you are into chocolate I have something for you! 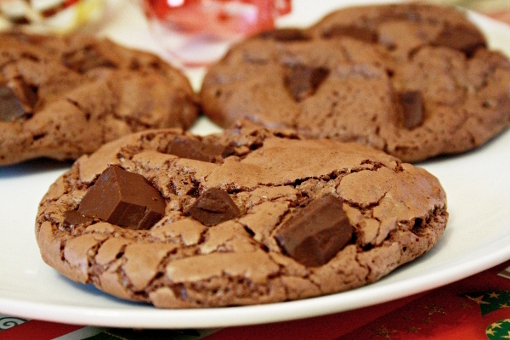 Chocolate Cookies – they are wonderful and really full of chocolate! They are almost more chocolaty than chocolate itself. 1. Preheat an oven to 350 F (176 C). 3. Chop the chocolate into chunks. 5. … the eggs and the vanilla extract until light and fluffy (about 4 minutes). 6. While the mixer is doing its job we can melt the chocolate with butter (not all the chocolate, just the first 8 ounces). You can do this in a bowl placed over a pot of simmering water or in a microwave oven. I had hard time trying to resist this. 7. 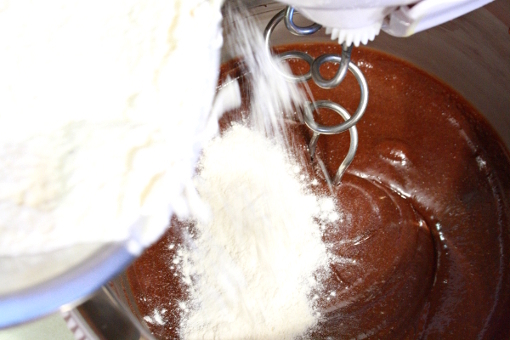 Now reduce the speed of the electric mixer to low and add the melted chocolate mixture. 8. In a separate bowl whisk together the flour, baking powder and salt. 9. Stir in the chocolate chunks. You can set some chunks aside to place on top of the cookies. 10. Drop heaping tablespoons of the dough 2 to 3 inches apart onto the baking sheet. 11. Bake, rotating the sheet halfway through, until the cookies are shiny and crackly yet soft in centers, 12 to 15 minutes. This lovely recipe was adapted from marthastewart.com and makes about 12 (3-inch) cookies. 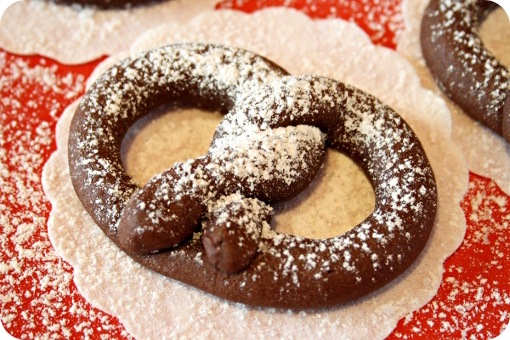 The inspiration to make these cookies comes from Martha’s Chocolate Pretzels but I have changed her recipe quite a lot. These pretzels taste like coffee, chocolate and cinnamon all together. 1. In a small bowl, mix together the instant coffee, cocoa and cinnamon. 2. Pour the boiling water into the bowl and stir thoroughly. Set aside. 3. Put the butter and granulated sugar in the bowl of your electric mixer. Then add the egg, vanilla extract and salt and mix again. 4. Add the cocoa-coffee-cinnamon mixture and beat slightly. 5. Gradually add flour, and mix until a smooth dough forms. 6. Turn out on a lightly floured counter and form a ball. Wrap in foil and refrigerate for about one hour. 7. Preheat an oven to 350 F (175 C). 9. Shape the dough into a log and cut it into 18 equal pieces. Form a small ball from each piece. Shape the balls into 12-inch-long (30 cm) ropes. 10. Twist each rope into a pretzel shape (I recommend doing this on the baking sheet because it might get a bit awkward to transfer them onto the sheet). 12. Remove from the oven and let cool on a wire rack. 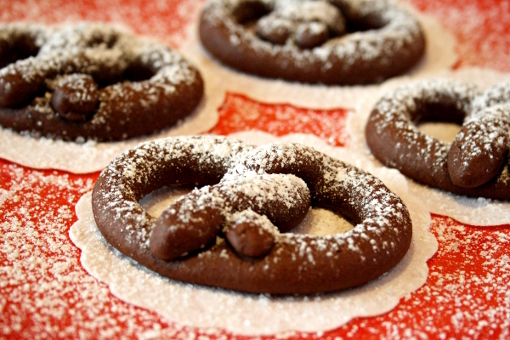 If you’d like your cookies a bit more festive you can sprinkle them with some confectioner’s sugar. 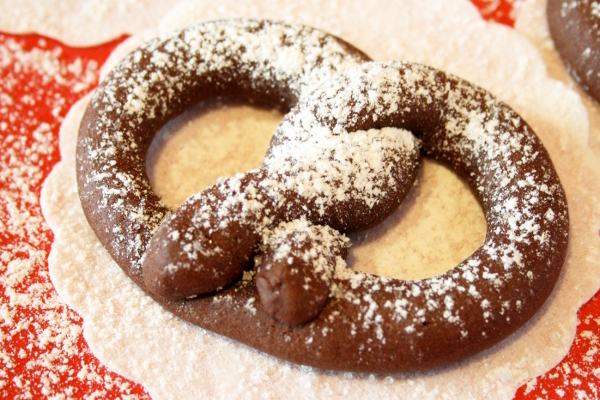 These cute and delicious pretzels can be stored in airtight containers at room temperature up to 1 week.